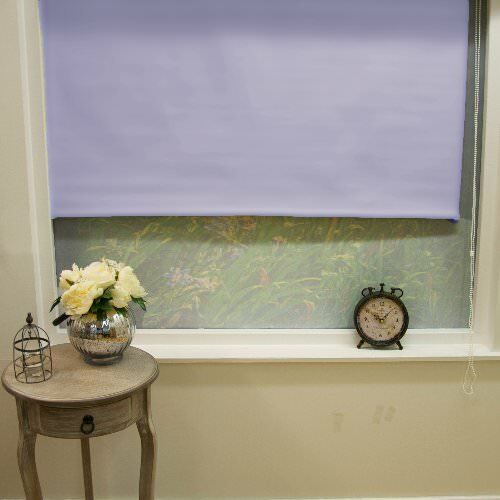 Roller blinds look good, are easy to use and maintain, and offer privacy at the pull of a cord. What’s more, you can install them yourself without any special training or expertise. The job takes a matter of minutes. Let’s take a look at how to hang roller blinds like a pro. Plain Dyed Straight Blackout Roller Blinds. Get them here. Before you’ve even bought your blinds, you’ll want to do a little bit of groundwork. In most cases, you’ll be fitting roller blinds inside your window frame. This minimises their visual impact, limits costs, and frees up space around the window for decorations, furnishings, and additional dressing like curtains. Some sorts of blind, however, can be attached outside the frame. You might hang them from the wall above the frame, or from the ceiling. Blinds of this type tend to make a bigger visual impact. When making your decision, you’ll want to account for any obstacles that might obstruct the blind as it’s being unfurled. Some window handles, for example, might protrude to the extent that the blind cannot be opened fully. This is one example of a situation where it makes sense to move the blind outside of the frame. Next, it’s time to measure your window for your roller blind. First of all, measure horizontally across the space you want the blind to cover. If you’re installing your roller blinds inside the window frame, you can take multiple measurements at various points up and down the frame. The discrepancy between any two measurements shouldn’t be more than a few millimetres. Note that you’ll want your blind to be slightly smaller than the space available, but not so small that light can get through the sides. When measuring up, be sure to leave around 5mm at either side of the window. This extra space will be taken up by your brackets. If you really have to, you can always cut the blind down to fit the space. Finally, you’ll need to decide which way round you’re going to be installing the blinds. If you’d like the roller exposed, then you’ll want to go under. If you’d like it concealed, you’ll need to go over. The latter can help if you need a little more clearance from the window in order to avoid protruding objects like handles. You’ll also want to think about which side of the window you want the cord to be on. This is something you can think about post- purchase, provided that the blinds you’ve chosen allow you to switch the side the chain hangs from. So you’ve chosen a set of blinds and you’re ready to install them. Here’s what you need to do next. Every set of roller blinds should be supplied with a pair of brackets, designed to hold the cylinder in place. While the precise method of installation will vary from blind to blind, the principle remains the same: you need to place the brackets close enough together that the cylinder won’t fall out, but not so close together that you can’t get it in to begin with. In almost all cases, your roller blinds should be fitted to the top of the window, so that they cover it in its entirety. Mark where you want to position your brackets with a pencil. Use a hand-drill to drill small holes where you intend to screw the brackets. Screw the brackets into place. As we’ve mentioned, you may need to trim a little from the edge of your blind in order for it to fit the window (that is, if you’re installing inside the window). To do this, you’ll need a pencil, a tape measure, a long ruler and a pair of scissors (or a Stanley knife) and a hack saw for the aluminium tubing. Measure the width of the recess and subtract 10mm (5mm for the brackets on either side). Mark the required distance at several points across the length of the blind. Connect the dots with a single straight line. We can’t emphasise enough how important it is to double-check your measurements; once you’ve removed a piece of fabric, it’s near-enough impossible to undo the damage. Your fabric should be perfectly square before you try to reattach it to the roller. If it isn’t, you’ll run into problems when you try to roll the blind back up. When you’re rolling the blind back up, use both hands, and ensure the chain mechanism is on the correct side. This will reduce the likelihood of an alignment error occurring. The adhesive on the roller might be protected by a special strip, which you’ll have to remove before the blind will stick. If you’ve correctly completed all the steps, actually hanging your blinds should be pretty simple. First, insert the side of the roller with the chain mechanism attached. Then slide in on the other side. Most blinds come with a springing mechanism that will hold the blind into position. Never leave the chain to hang loose, you must secure a hook to the wall. This is especially important in households with pets and small children. Your blinds will come with a hook specifically for this purpose; mark the position of your hook with a pencil and secure it into the wall, in the same way as you secured your fittings. Not bought blinds yet? View our roller blinds here, or our complete range of blinds here.